No matter what your workers need to get the job done, Motorola's MC75 Worldwide Enterprise Digital Assistant delivers by combining an unparalleled number of business capabilities into an easy-to-carry rugged device. The MC75's 3.5G HSDPA and 3G CDMA-EVDO (Rev A) support provides high performance voice and data services around the globe. Your workers will enjoy having all the features they need right at their fingertips in the MC75, designed to endure all-day, everyday use outside the enterprise - including push-to-talk, integrated GPS with superior sensitivity and tracking capabilities, 1D and 2D barcode scanning, a high resolution 2 megapixel autofocus color camera, 802.11a/b/g wireless LAN (WLAN), Bluetooth and IrDA connectivity. 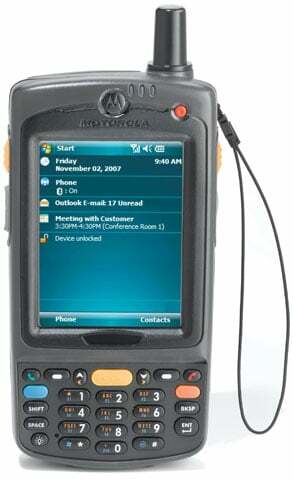 The Motorola MC7506-PKCSKQWA9WR is also known as SYM-MC7506PKCSKQWA9R	or MC7506PKCSKQWA9WR	.